The National Biodiesel Conference trade show is in full swing. 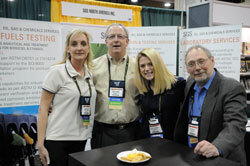 This evening we had a networking reception in the Expo Hall sponsored by SGS North America. Here are our sponsor all in smiles at their booth. The trade show provides a great opportunity to visit with companies and service providers for the industry. There is a central “networking” area set up with chairs and couches to help facilitate comfortable discussions. I’m going to try to get some interviews with our exhibitors tomorrow after the morning general session and post for you here.